The CIA assesses the two spectacles: a practiced killer leaving a trail of bodies across Europe, and a large airplane disappearing without a trace. The two affairs are increasingly seen to be intertwined. Langley realizes the killer is a man long thought to be dead, and the lost airliner has been highly modified into a tool of unimaginable terror. 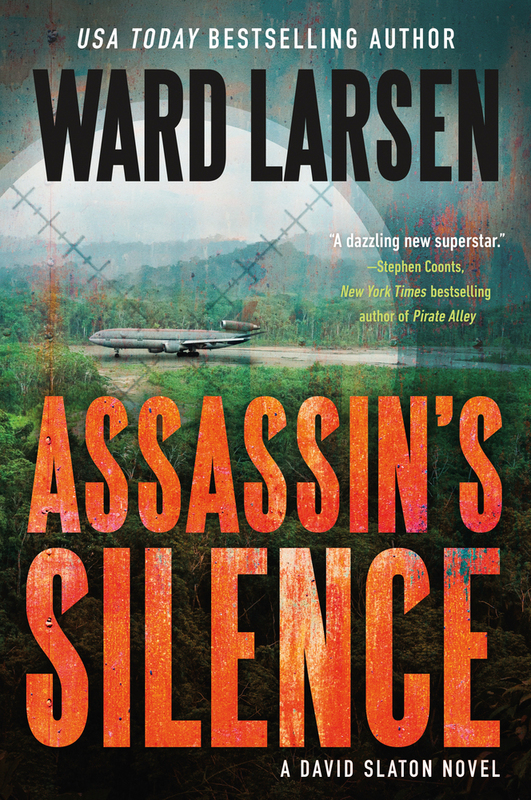 ASSASSIN’S SILENCE is author Ward Larsen’s third novel in his series featuring Israeli Mossad assassin David Slaton as the main character. The novel’s opening prologue describes a scene where radioactive material is discovered in the ruins of a bombed-out Syrian village. The story then moves to Slaton living a life as a stone mason on the island of Malta after faking his death to protect his wife and the child he’s never seen. Even his wife believes he is dead. Surprisingly, an enemy learns of his new identity and Slaton must escape from an attack on his life. Slaton’s training naturally puts him on a hunt to find the who and why of the attack. His search takes him to Europe and the Middle East where Slaton has left a trail of bodies. He also realizes his family could also be in danger and sets a plan in motion to project them. At the same time, an old airliner sitting at a remote airport in Brazil is quickly purchased, refurbished and then it mysteriously disappears off the coast of Brazil. Each of these events draws the attention of the CIA and the more they learn, the more they realize the events are not mutually exclusive. The CIA and David Slaton must work together to prevent a horrendous terror attack. Ward Larsen has taken several different suspenseful storylines with an interesting cast of characters and skillfully pulls it all together in an exciting novel. The combination of the CIA, an ex-Mossad agent and his family, radioactive material and a mysterious plane crash mesh nicely into a first rate thriller. Among all the twists and turns, Larsen saves his best for last and closes this classic thriller with a great finish. Anyone who enjoys thrillers will like ASSASSIN’S SILENCE. Although the novel stands on its own I believe reading the prior David Slaton novel would only increase the enjoyment in reading ASSASSIN’S SILENCE. Thanks to Booking Pap Pap and the publisher for providing a review copy of this novel. I was thinking it sounded like it had a lot going on. I'm glad to see it all meshed together well.